“This is extremely encouraging,” said Dr. Anthony Hassan, the President & CEO of the Cohen Veterans Network. “We’re making veterans’ lives better and we’re making their families’ lives better." 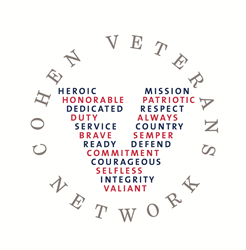 Forty-six percent of veterans treated for PTSD at Cohen Veterans Network clinics improved enough after treatment that they no longer met “the clinical threshold for the diagnosis,” the non-profit mental health network said in a report released today. The client improvements for PTSD were paralleled by progress for clients treated at the Steven A. Cohen Military Family Clinics for Depression and Generalized Anxiety Disorder; more than half of those treated showed sufficient improvement in that they did not meet the clinical thresholds for those conditions after treatment. Ninety-three percent of clients reported that after treatment they could now “deal effectively with my problems,” and three-quarters said their relationships with their spouses, children, friends, and non-family members had improved. Seven in 10 said they were now able to function at work, after treatment at the Cohen Veterans Network, the report said. CVN’s Growth and Measured Performance summary report analyzes results from more than 3,700 clients since the network launched publicly in April 2016. The data also shows that CVN is living up to an initial promise to provide tailored, high-quality mental health care for the entire military family with low barriers to care. More than 40% of all CVN clients are family members and children. Among all clients, 58% were veterans and 23% of those were female veterans. CVN clients are reporting nearly 100% satisfaction around the network in areas such as wait times, customized treatment, length of time between sessions, and quality of care. “The fact that 97% of our clients would recommend our clinics to a veteran, friend, or military family member speaks volumes about our early performance, trust, and military competence,” Hassan says. Today’s summary comes out on the second day of the Cohen Veterans Care Summit in Washington D.C. This information will be discussed as CVN leads workshops on Learning Mental Health Systems, Meaningful Data, Implementation Science, the Opioid Epidemic and the Reimbursement Landscape and Mental Health Parity. CVN has seven clinics currently in operation and will launch Steven A. Cohen Military Family Clinics in Clarksville, TN, Killeen, TX, Denver, CO, and Orlando, FL by early 2018. The network formally launched in April of 2016 behind a $275 Million commitment from Founder Steven A. Cohen.